Left to right: Annabelle Lytle-Rich '10, Eve Lytle-Rich, Curtis Rich '79, Rosalind Lytle-Rich '17, and Kathy Lytle. 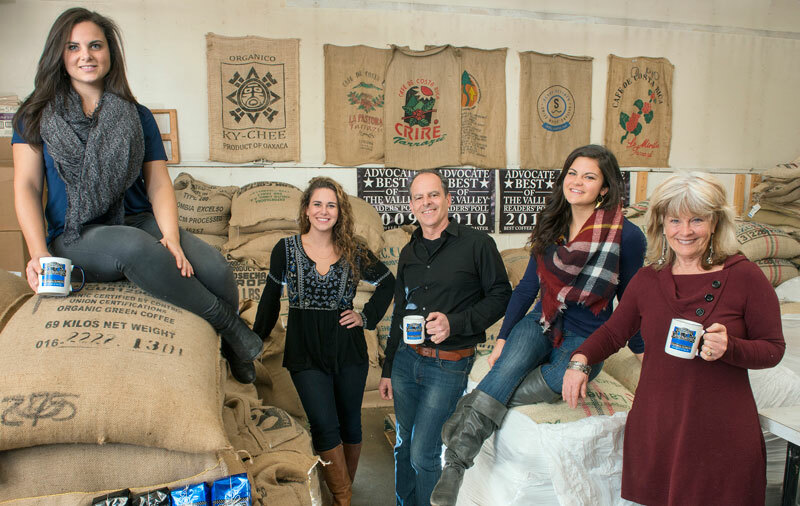 When Curtis Rich ’79 and his wife ordered nine bags of specialty coffee to sell out of a tiny storefront in a small Massachusetts town in 1992, one customer wondered aloud whether they’d ever be able to sell all that coffee. 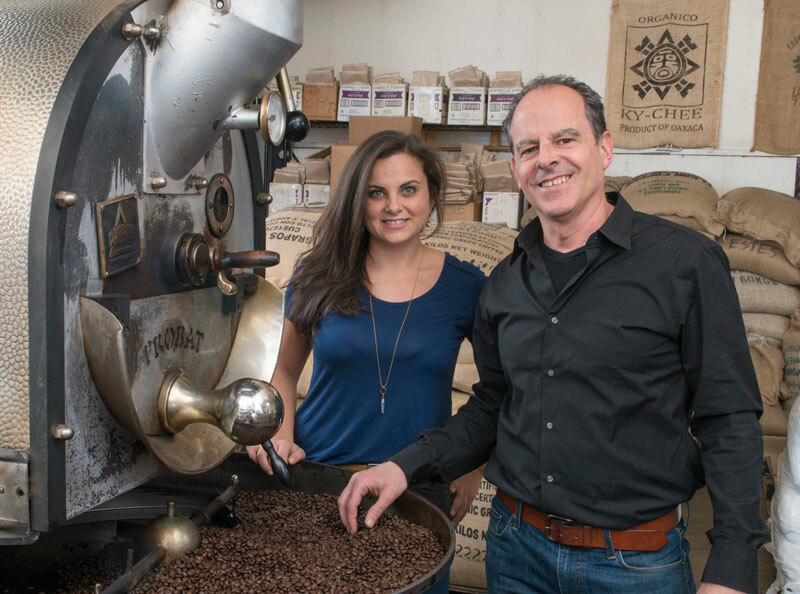 Now, Rich and his wife, Kathy Lytle, own a growing business, Shelburne Falls Coffee Roasters, roasting 2,000 pounds of coffee a week and selling it at seven homey stores in the western part of the state. They have 85 employees, serve about 1,500 customers daily, and bring in some $3 million a year through retail sales and a small wholesale business. It is a family affair with a Vassar flair. Daughter Annabelle Lytle-Rich ’10 is the general manager. 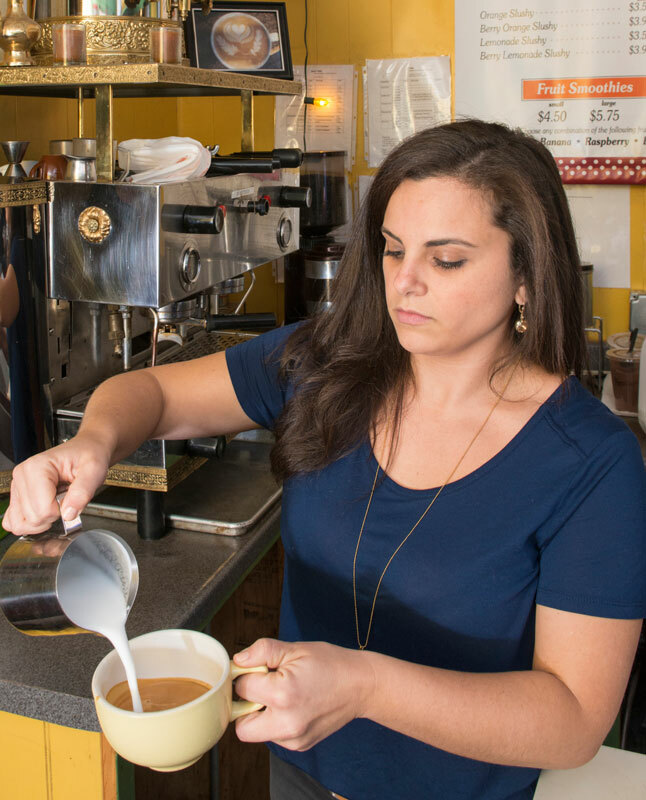 Rosalind ’17 has worked as a barista and plans to eventually join the business. Daughter Eve, who like their mother is a nurse, also works in the business. Rich majored in English and Annabelle in history. Rosalind is a classics major. Rich, a native of New Rochelle, New York, got his first taste of a good cappuccino when, as a high school student, he went down to Little Italy. When they were first married, they lived in Maine; they sold their first drink, an “Iced Island Delight,” on the ferry dock of Peaks Island on July 4, 1990. Then, they drove a van to fairs and festivals, introducing espresso to people along the East Coast. They settled down in Shelburne Falls, a picturesque village where they opened that first store. Two years later, they were roasting their own coffee and selling locally-made baked goods. Then came stores in nearby Northampton, Easthampton, Greenfield, East Longmeadow, and Hadley. When the building housing the original store burned down, they opened a larger store on the Mohawk Trail, the first scenic road in New England. Shelves held large bags of roasted coffee such as Colombian Supremo, Costa Rican Tarrazu, Guatemalan Antigua, Ethiopian Yirgacheffe, and Organic Peruvian that would next be divided into smaller packages for sale. All three girls grew up working alongside their parents. Annabelle started at age 2, helping make iced tea and making change from the register. After college, she taught third grade for two years in New Orleans through the Teach For America program, stayed an extra year, and then returned home to become the general manager. Annabelle-Lytle-Rich '10 at a Shelburne Falls Coffee Roaster store. Each store has the same color scheme: jade green, golden yellow, and farmhouse red, with wood floors and paneling and comfortable floral-patterned couches and easy chairs. Work by local artists covers the walls; games, books, and magazines invite customers to stay a while. Kyle Cogswell, a firefighter who stopped by the Shelburne Falls store to pick up a hazelnut coffee on a gray January day, observed a bulletin board covered with cards offering music lessons, yoga classes, the services of a photographer, an invitation to a music bash, and more.